Eight fire engines were called to the huge blaze in Scaynes Hill Road, Lindfield, Haywards Heath, which also involved an outbuilding. A spokesman for West Sussex Fire and Rescue Service said today: "We were called to a report of a fire in Scaynes Hill Road, Lindfield at 4.18pm yesterday afternoon (March 20). "One appliance initially attended from Haywards Heath, and upon arrival was met with a well-established fire. "A further seven appliances attended from Burgess Hill, East Grinstead, Crawley and East Sussex (eight in total), along with specialist appliances including a water carrier. 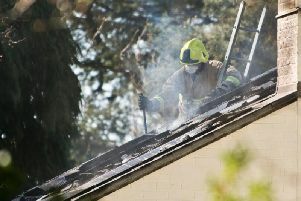 "Crews worked through the evening to extinguish the fire using nine breathing apparatus, five jets, hose reels and foam. "One campervan and four caravans were destroyed, while further damage was caused to an additional campervan and around five per cent damage to an external part of an out building. "The incident was then scaled back to one appliance, which remained overnight to inspect the scene. The cause is currently under investigation."